1. Call Out A - The movement of the cash flow in between the 4 quadrants. 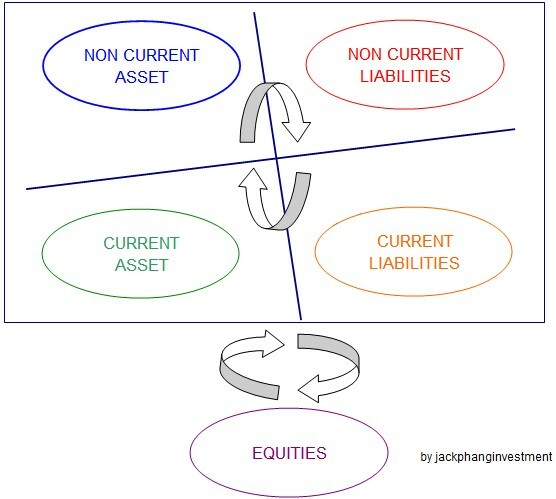 The faster the cash flow movement in the 4 quadrants, the bigger cash flow will be generate out and hence you would be able to purchase more current assets as well as non current assets that can get your more equities (I could relate it to a retirement fund that you would need it when you are retired). However, please take note that you have to start small first. As your experience of managing cash flow becomes more and better, then you can start looking at how to create more assets within shorter period. It can be leveraged by using other people's money (for example - the Non Current Liabilities & Current Liabilities) as well as other people's time (for example - outsource your non profit generating assets to experts that can manage it better than you). 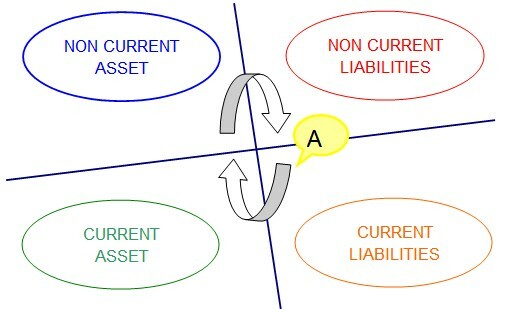 Else, you can focus on the assets / liabilities that you are familiar with. 2. 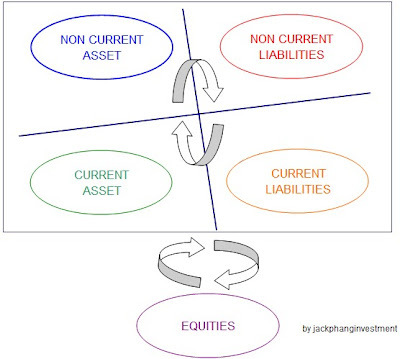 Call Out B - Movement in between the Assets / Liabilities and Equities. To be frank, a young graduate's invested capital is different from a professional in 30 years old. However, the advantage of a young graduate against professional is that, he still have plenty of the time turn over his equities (invested capital) from a smaller amount to a bigger amount. You can read my post - Return = Invested Time Horizon * Investing Growing Speed to understand this concept in more detail. 3. Upper part of the quadrants - Long Term Play. Long term play requires a debt management skill set that you may need time to practice it over time. As most of the people would worry about the burden of the loan amount that they are taking to purchase the non current asset. So the KEY POINT here is how you are going to survive in a long run. 4. Lower part of the quadrants - Short Term Play. How you are going to survive in a short run is shown as below. 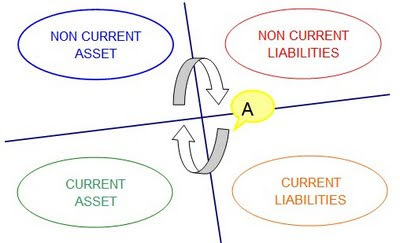 As long as your current asset is enough to cover current liabilities, then you are able to survive and to grow your non current assets in long run. So I will write a detailed post on how to survive in short term play in another post. So, you will know that your equities (means the invested capital) may not be as big as possible to generate a huge Asset base. Be smart to learn how to grow your 4 quadrants so that you can achieve financial freedom soon.